Kip is a 15 year-old human boy originally from a Core world on which a small number of plutocratic elites, known as “Patrons”, compete with one another to find and sponsor athletically-, artistically-, or intellectually-gifted children culled from the vast proletariat masses (“Laborers”). Sponsored children leave their Laborer-families behind and attend brutally meritocratic, specialized academies to hone their skills. Upon graduation, each reimburses his Patron for his education by working – for life – at one of the Patron’s many business ventures. Kip was found by a Kollara Industries scout when he was 5 years old. Word had begun spreading in his sprawling tenement neighborhood that Kip had an unmatched talent for repairing or modifying any mechanical device put before him. 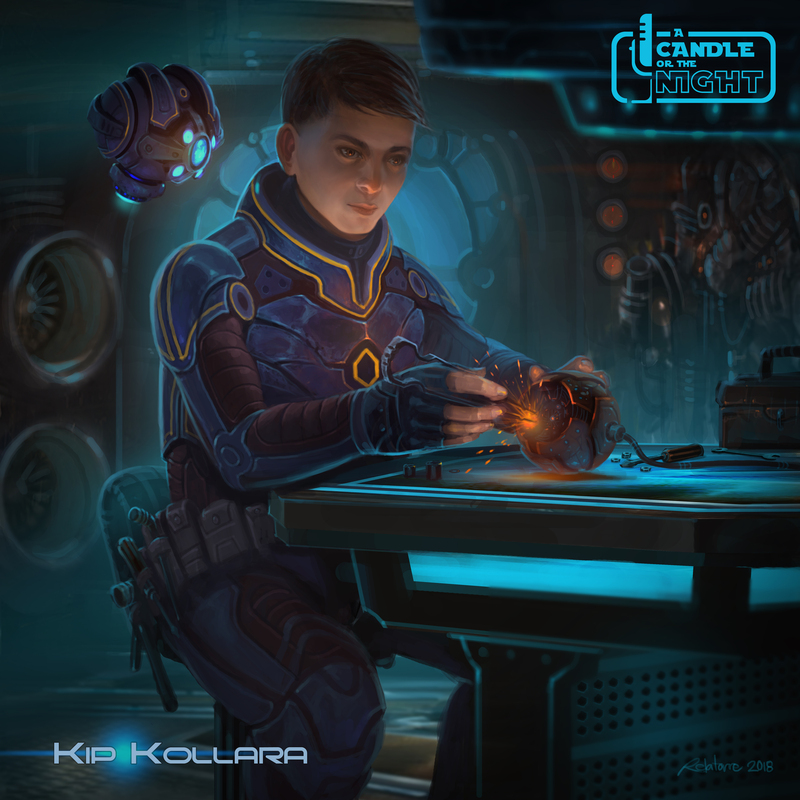 Just two years before, the same Kollara scout had missed out on securing Kip’s older sister, Ruul, who was found by a Sarconen Consolidated agent. It stung the Kollara scout that he had dismissed rumors of a young girl exhibiting exceptional mathematical prowess because the sector hadn’t produced an “N-T” child in over two decades (the sector was better known for “A-Ts” – athletically-gifted children – which were found every 2-3 years). So at the first whiff of the rumors surrounding Kip, the scout presented his parents with the scholarship contract and whisked Kip away to Kollara’s engineering academies. Despite his young age, Kip’s natural mechanical aptitude allowed him to not only survive but thrive in the academies. Even when his projects were sabotaged by the older students, Kip almost always seemed to pull through with a last-minute repair or modification. On a few occasions, he even managed to construct a brand-new device from the wreckage his fellow students left him. Sure, Kip had a penchant for exhibiting quasi-ritualistic, routinized behaviors, a knack for missing social clues, and a clear discomfort with making eye-contact, but this was all overlooked because his genius was readily apparent. And after just five years of training, he was already being heralded as a once-in-a-generation talent. It was Kip’s young age and clear talent which proved too strong a temptation for the head of the Kollara family, Telamon Bel Kollara, from bragging about the years of prolific work – and profit! – he could expect from Kip’s endeavors. And perhaps it was a business rival or just an enterprising privateer that kidnapped a 13 year-old Kip while he was visiting his parents during Lux, the annual three-day festival dedicated to Laborers. Kip was immediately taken off-world and put to work repairing the transports and upgrading the gear of various smugglers, pirates and other criminal enterprises. Every few months during that first year after his kidnapping, Kip would be traded to another gang and put to work building, repairing, and modding an extensive array of vehicles, armor, guns, and gear. Each time he was traded, the new gang’s territory would be further and further away from the Core worlds such that, for the last year, Kip had been traded between gangs operating exclusively in the Outer Rim. The leader of the last gang that Kip was forced to work for was a Zabrak pirate named Jaggasan. For reasons unknown to Kip, Jaggasan took a liking to him and would often talk to the youth about a wide range of topics. But Jagassan had two favorite topics he would return to over and over again. The first was how to amass and channel power whether it be physical power, social power, political power, economic power, or something the pirate obliquely referred to as “inner” power. The second was the Jedi and Sith and how pathetic they were for being slaves to dogma, for a shackled mind can never evolve. Truth be told, Kip didn’t follow everything Jaggasan said because his talks often descended into rants. The only thing Kip knew of the Jedi was the basic outline of what every good citizen of the Empire knew: the Jedi were a cult of religious zealots who became monstrously vicious terrorists when their political coup failed, but luckily they were eradicated by the Emperor years before Kip was even born. As for the Sith, Kip had never heard of them before meeting Jagassan. In the weeks prior to the Rodyle Luxury Holdings job, Jagassan had been keeping Kip close, never letting the kid out of his sight. Even to Kip’s underdeveloped sense of other people’s motives, Jagassan’s behavior felt dark and ominous. So when the Rodyle Redoubt erupted into chaos and Kip found himself separated from Jagassan for the first time in weeks, Kip saw his first real chance of getting back home when he saw Jensa, Viktor, Tyrus and Bior. He took the chance to call for help and was both surprised and relieved when they helped him escape. The question now is, would he ever get home or did Kip just replace one group of pirates with another?